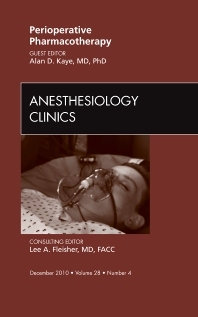 In this issue of the Anesthesiology Clinics, there are many exciting pharmacology reviews giving us a glimpse into future practice. It begins with a definitive review by Drs. Pamela Palmer and Ronald Miller on current and developing methods of patient-controlled analgesia. There are five focused reviews on drugs designed and utilized in pain management and drug addiction: buprenorphine, acetaminophen, an oral sufentanil preparation, and tapentadol. These reviews are timely because so many new drugs have come to market to modulate and to better target pain and inflammation. Likewise, there has been an explosion in use of a number of anticoagulants that modulate the coagulation cascade. Two reviews provide a clear understanding of how many of these newer agents work, discussion of the new recombinant activated factor VII (Novo7®), and guidelines for these drugs in clinical anesthesia and pain practice. Evolving understanding and clinical use of dexmetomidine, in the OR, ICU, and peripheral sites has reshaped the practice of sedation for a large population of patients. These topics describe highly clinically relevant perioperative agents. There are also reviews on pharmacological options in the management of patients with hypertension, cardiac disease, and new cardiac anesthesia agents in the OR and ICU. There is a special review on the role of statins in cardiac anesthesia, a very exciting and evolving topic. Also reviewed is levosimendan, a calcium sensitizer utilized for acutely decompensated congestive heart failure and shown to reduce cardiac troponin release after cardiac surgery. Lastly, the future of induction and inhalation agents and structure-based modifications are examined.